When I choose which Five in a Row title to row, I always discuss it with the boys. I want them to have some ownership over their education, so allowing them to choose what we study together is important. The request that led us to The Salamander Room was insects and arachnids. The science lessons in the manual went well with their interests, and it was a fun row. They loved the book, and Emory is very into "imaginary" things right now anyway, so we've heard a lot of crazy insect stories since this row! I asked the boys to each choose a side for the activity in the manual. Instead of "mother" and "son" side (someone would surely object to being the mom) I asked one to be Questions and one to be Answers. Emory was supposed to be Questions but he was too busy answering the questions as I paused for him to put a piece in. Elliott's job was to put a matching pattern block in for each of Brian's answers. I did this on Day 2, so we'd already read through the story. Emory was learning /S/ during the week we rowed this book, so S is for Salamander. Elliott's was from Homeschool Share's The Salamander Room Lapbook of course. I pick and choose from their lapbooks, but their copywork comes in handy. I'll probably start making my own in cursive soon though. We ended this activity by drawing salamander rooms! Eleanor has a ladybug counting book that she loves, so when she saw The Grouchy Ladybug in our book basket, she insisted I read it. It was a little long for her, but she liked finding the ladybug on each page. We also read Are You a Ladybug? We have a couple of these books and they are cute and informational without being overwhelmingly scientific. They are great for preschool and K level. After these two books, the boys definitely knew they couldn't keep any ladybugs in the house, because we don't have aphids! Of course we had to read The Very Hungry Caterpillar. Elliott found this little set my sister-in-law gave me, and Emory was eager to make up his own story! It ended with him telling me the lifecycle of the butterfly, without me even asking! The manual was very light on suggestions for these subjects, which worked out since I focused so heavily on science this week, so we did not do anything specific except place our story disk on the map and in our passports. We chose a random spot in the Eastern United States, where Brian was likely to find his salamander. We discussed reptiles back when we did our TMNT unit study, so we read some general characteristics of amphibians, compared them, and then listed Five Fast Facts about Salamanders (from Homeschool Share). The boys looked at pictures in a couple of books and colored a salamander, and we discussed the lifecycle as well. We discussed Vertebrates and Invertebrates first. Then I gave them a mixed stack of cards and asked the boys to sort them into vertebrates and invertebrates. Emory wanted all the "bug" cards for himself anyway, so this was easy for him! Then I asked them to take the Invertebrates and sort them further into insects and arachnids. For our FIAR notebooks we found examples from magazines for each group. We enjoyed reading fun tidbits about these animals too. Two headed snake, anyone? This was Elliott's top pick. A "flying fish" according to Emory!
. . . and Emory did Who is Who? Something had to be green. Emory also completed this insect shadow matching activity. It was the weekly "worksheet" activity from La La Logic (upcoming review) which was great timing! The boys insisted we add arachnids. This part ended up being very relaxed. I included several books about spiders and scorpions, and general "bug" books in our book basket, and the boys spent a lot of time looking through them. Elliott also read Spiders out loud to Emory. The boys liked the pictures in this book, but I wish they were all labeled, because I couldn't tell them what kind of spiders they were looking at. We also read about scorpions from a book that included a real one encased inside. The kids had a little fun drawing silly bugs with this roll-and-draw game. Then they named their bugs after their brother. We also played with toy bugs and used a little book called How to Draw Bugs for some more drawing fun. Emory chose a mosquito, so I took the opportunity to read Why Mosquitoes Buzz in People's Ears out loud to the boys. When we were talking about how spiders eat, it led to a discussion of Charlotte's Web, which we listened to on audio book last year. This led to looking up the movies on Netflix. So they found the newer version and watched it, and then later watched Charlotte's Web 2: Wilber's Great Adventure. When they were looking the movies on Netflix, Stuart Little popped up as a recommendation, and that led us into a discussion about E.B. White. Stuart Little was then requested as a read-aloud. So there are all these cute buggy snack ideas on Pinterest, but we stuck to an old classic. My kids have never had dirt cups. We made ours with chocolate pudding for mud, graham cracker crumbs for dirt, graham cracker sticks for logs, and gummy worms. The husband told me on the Friday of this row that he wanted to go to the aquarium over the weekend. It's been a looong time since we've been anywhere like that, so it was a great surprise for the kids, and of course I was able to tie it into the unit because we were able to see animals from all the major groups. It ended up being a great way to end the unit! So . 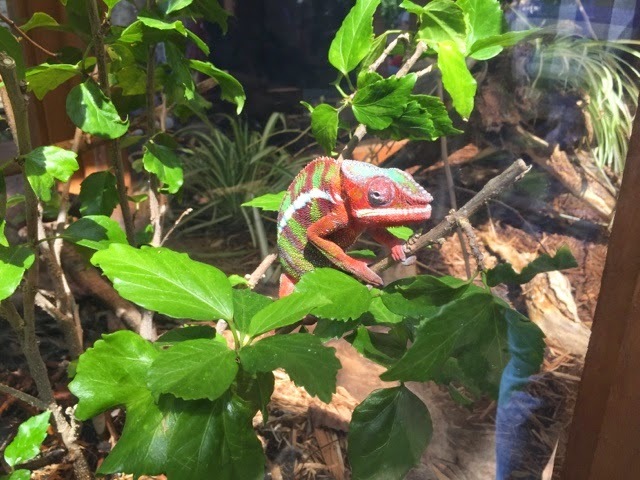 . . obviously not an amphibian (I actually didn't get any pictures in their Frog Bog), but this chameleon I think was my favorite picture from the whole trip. He looks like a grumpy old man. It always makes me smile. So here's our full visit to the Newport Aquarium. This was another really fun row!